Utah is The Beehive State. The honeybee is our state insect and there are over 700 beekeepers managing nearly 30,000 colonies in Utah. These bees probably visit your fruit trees and gardens and they are critical for our food production and for healthy landscapes. For many fruits and vegetables, no pollination means no fruit. Reduce pesticide exposure by specifically looking for chemicals that aren’t toxic to bees. You can also apply pesticides less frequently and be sure to avoid spraying blossoms (even weeds). If possible, spray when bees are not flying, such as after dusk or before dawn. Provide a healthy habitat by planting native plants and a variety of plants rather than just a few, so there are blooms throughout the growing season. 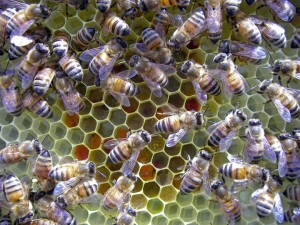 If you have space, become a beekeeper or contact a beekeeper to put honeybees in your yard. You can also provide nesting materials for solitary bees, which do not produce honey and do not sting.